to generate the necessary tables for my finite state machines I'll l try to find all diagrams which are reachable in a package and its sub packages. I tried to find a wayby reading the API guides but I'm not able to find it. 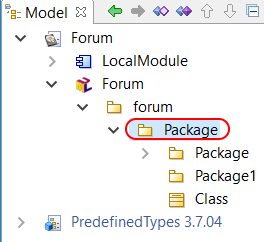 Are there code snippets for modelio 3.7.1 available which can help me to iterate throught the packages? Last Edit: 8 months 15 hours ago by Ralf Ebert. Just a little tip which, I hope, would be useful. Let's imagine you have the following model. will return only package elements i.e.